Strange Object Buried In Ice: Recovery Begins! One year ago Swedish Ocean Explorer Team (Ocean X), using sonar, came across something buried under the ice in the Baltic Sea. Tons of hopeful theories have been tossed around as to what it may be. Ufo? Sunken ship? Arctic Stonehenge? No one could guess from the sonar imagery. 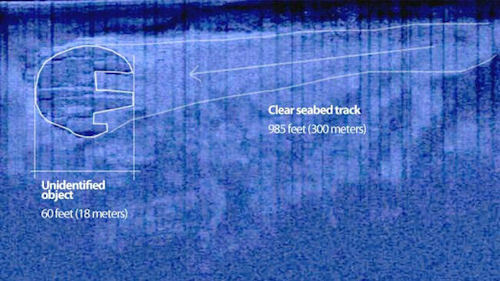 Now, a year later, Ocean X is actually on site and beginning a deeper investigation into what this thing is that has even them baffled. As they continue to uncover the mystery, pictures are starting to emerge from the site causing even more speculation and excitement. There is definitely something down there. While the research team from Ocean X, a company that finds sunken ships and sells what they find for a substantial profit, explores the site their finds are not making this discovery any less fascinating. Pictures and video are beginning to pop up online as the divers explore the strange anomoly. While the team has stated that it could be anything including a strange geological formation, they’ve also said that, due to funding, they don’t have much interest in spending too much time exploring it and need to get back to work on more profitable ventures. “The object appeared more as a huge mushroom, rising 3-4 meters/10-13 feet from the seabed, with rounded sides and rugged edges. The object had an egg shaped hole leading into it from the top, as an opening. On top of the object they also found strange stone circle formations, almost looking like small fireplaces. The stones were covered in something resembling soot. We just want them to watch a copy of John Carpenter’s The Thing before they start messing around too much…oh…and to put their dogs away. A wooden version of Stonehenge was found less than a kilometer away from the original landmark Thursday. Using sophisticated equipment researchers have uncovered a very similar structure buried in the earth. The new site is thought to be a complementary site to the original Stonehenge. While they have only just begun to analyze the data and have no plans of actually digging up the new find it is believed that the two structures were built around the same time. Whether this new structure has anything to do with the wooden Stonehenge in Cincinnati we reported on yesterday remains to be seen. Woodhenge, Stonehenge’s New Cousin, Found In Ireland! Archeologists have uncovered an ancient wooden replica of Stonehenge at the Hill of Tara in Ireland. Pictured above is an artist’s rendering of the massive ring as it would have looked in its heyday. Scientists speculate that it would have taken an entire forest of trees to provide enough wood for it’s epic circumference. Posted in Archaeology, Stonehenge | Comments Off on Woodhenge, Stonehenge’s New Cousin, Found In Ireland! You are currently browsing the archives for the Stonehenge category.